SAT, ACT, New SAT, PSAT and SAT Subject Test Practice Problems are provided for students of OptimalSATPrep.com and others. A Word Problem for TJ/AOS/SHSAT/SSAT Prep. (Medium). Target Time. 15-30 seconds. A person's estate was divided into four shares. The third largest share was one fourth of the largest share; the 2nd largest share was four times as large as the smallest share, and the smallest share was 1/8th of the largest share. If the difference between the smallest and the 2nd smallest share is $49 million, What was the value of the entire estate? A Geometry Problem for SAT II Subject Math Level II Test. (Hard), Target Time. 45-60 seconds. The figure below shows an isosceles right triangle with an inscribed circle P and an equilateral triangleACD with an inscribed circle O. What is the ratio of the area of circle O to the area of circle P? A Partial Pressure for Chemistry SAT II Subject Test. (Medium). Target Time. 15-25 seconds for each part. 2 liters of H2 and 2 liters of N2 gases are mixed at a high enough temperature for the reaction to go to completion at constant temperature in a closed system with final volume of 4 liters. 1. What is the final pressure? 2. How many liters of NH3 will be produced? 3. How many liters of H2 and N2 will be left over? A Geometry Problem for SAT II Math and ACT Prep. (Easy). Target Time. 20-45 seconds. The figure below shows two semicircles with diameter OP and AB. Right triangles OQP and ACB are inscribed in the larger and the smaller semicircles respectively. Line segment ratios are as specified. What is ratio of the shaded region outside OQP to the shaded area outside ACB? A Chemistry Problem for SAT II Subject Test. (Easy). Target Time. 60-90 seconds. 80 g of CaCO3(s) is mixed with 300 ml of 0.5M HCl at STP. How many ml of CO2 gas will be produced? A Geometry/Trigonometry Problem for SAT Math/ACT/TJ Test Prep Problem. (Easy). Target Time. 13-35 seconds. The figure below shows two adjacent right triangles, ABP and AXP with degree measures as shown and AP =8. What is the length of AC? An Algebra Problem for SAT/PSAT/ACT Prep. (Medium). Target Time. 2-40 seconds. At how many points graphs of X^2 + Y^2 = 9 and X*2 - Y^2 = 9 intersect? The figure below shows a right triangle ABC with a square PQRC and smaller right triangles APQ and QRB drawn within ABC. What is the ratio of area of the green region to area of the yellow region? A Geometry Problem for ACT and SAT Subject Test Math II (Hard). Target Time. 20-45 seconds. 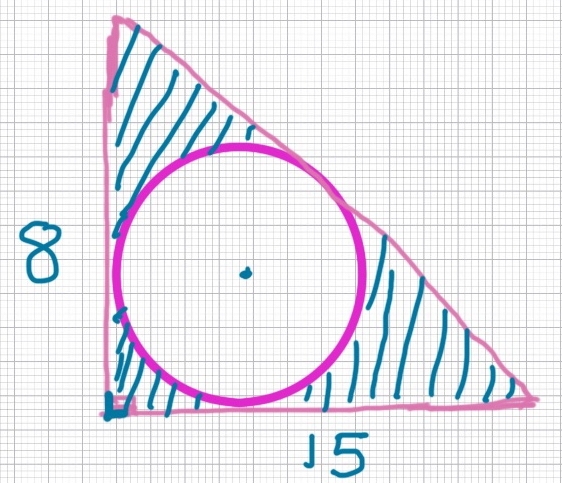 The figure below shows a right triangle (legs 8 and 15) with an inscribed circle. What is the area of the circle? An Algebra Problem for the New SAT (hard). Target Time. 20-40 seconds. (3^ 2P) / (27 ^ Q) = ? A Function Problem for the NewSAT/PSAT Prep. (Medium), Target Time. 15-40 seconds per part. 6. If ant 1 and ant 2 reduced the length of their respective path steps (diameter of the semicircle or side of the square to smallest possible step each could take) A) what would be the shape of the path each would take and B) What would be the difference between f(X) and g(X)? A Geometry Problem for SAT/SAT Subject Math Test Prep (Medium). Target Time. 20-35 seconds. ABC and PQT are two equilateral angles. The sides of ABC are 6 units long and the altitudes of PQT are SQRT (3). What is the ratio of area of PQT to area of ABC? An Algebra Problem for the new PSAT/SAT and ACT Prep. (Medium). Target Time. 15-35 seconds. f(x) = X^2 - 4 and g(x) x^3 - 8. What value of x [-8,8] will satisfy both equations? A Percent Problem for ACT, SAT and PSAT (Hard). Target Time. 30-45 seconds. For non zero integers, A, B, C, and D, if A is B% of C then BAD is what % of DAD? An investment Problem SAT//ACT/PSAT Problem. (Medium). Target Time. 20-35 seconds. Aman, Brad and Chris raised money for their startup business. If the ratio of money raised by Aman to that by Brad is 3:5 and the ratio of money raised by Brad to that by Chris is 2:3. If the three friends together raised $6.2 million, what is difference between the money raised by Chris and the money raised by Abel? A Percdent Problem for the SAT/PSAT/ACT. (Medium). Target Time. 20-25 seconds. A mobile phone has a sticker (bar code) price of $D. If a discount of $m was offered to a buyer, disregarding any sales tax, by what %, the price of the mobile phone was reduced? On a map 1" represents 6 kilometers (km). What is the area of a national park in square km, if it's area on the map is 25 square inches? A Problem Solving Question for the New SAT/PSAT/ACT. (Easy). Target Time. 20-30 seconds. One mole of Oxygen gas reacts with two moles of Hydrogen gas to produce about 237 kilojoules of energy. How many moles of hydrogen gas will react with sufficient moles of oxygen to produce 1000 kilojoules of energy? A Trignometry Problem for the New SAT/PSAT/ACT and SAT Subject Test (Easy). Target Time. 15-35 seconds. A Probability Problem for the New SAT, SAT Subject Test and ACT (Medium). Target Time. 15-30 seconds. On the New SAT, every multiple choice question will have 4 possible answer choices. What is the probability that a student can get 4 out of 5 questions correct by randomly guessing on such a test?